Sail on the Persian Gulf on a luxury yacht, and experience Dubai from a unique vantage point. Witness some of the most famous attractions of Dubai in a new light, as you cruise around the Palm Jumeirah. Savor a relaxing cruise on a luxury yacht and behold Dubai from a new perspective. You may either kickstart your day in Dubai on the morning cruise, bask in the sunshine on the afternoon cruise or witness the magnificent sunset on the evening cruise; the choice is yours! Bask in the sunshine or mingle with other guests while you relish some of the finest food in all of Dubai during the yacht ride. Enjoy five-star hospitality and a red carpet welcome as you catch sight of some of the famous attractions of Dubai. You can choose from three different touring times. Breakfast, lunch or dinner will be provided depending on the time that you have chosen. You may either kickstart your day in Dubai on the morning cruise, bask in the sunshine on the afternoon cruise or witness the magnificent sunset on the evening cruise; the choice is yours! The plush interiors of the yacht will ensure that you can relax and enjoy stunning views of the city. The upper decks are spacious, and the lower deck has three cabins, along with washrooms. You will depart from the Dubai Marina, and go under numerous bridges along the way. Freshly prepared Breakfast and Live BBQ which will be served shortly after departure by the crew, with a selection of Croissants, Muffins and soft beverages for breakfast and lamb kofta, burgers, salad, desert juices and beverages for afternoon and evening tour. The spectacularly designed Dubai Marina Yacht Club will appear on your left. Next up is the Jumeirah Beach Residence, a collection of waterfront buildings that has 35 residential towers and five hotels. You will then go around the Palm Island, and see several well-known buildings including the Zabeel Saray, a renowned resort, and spa. 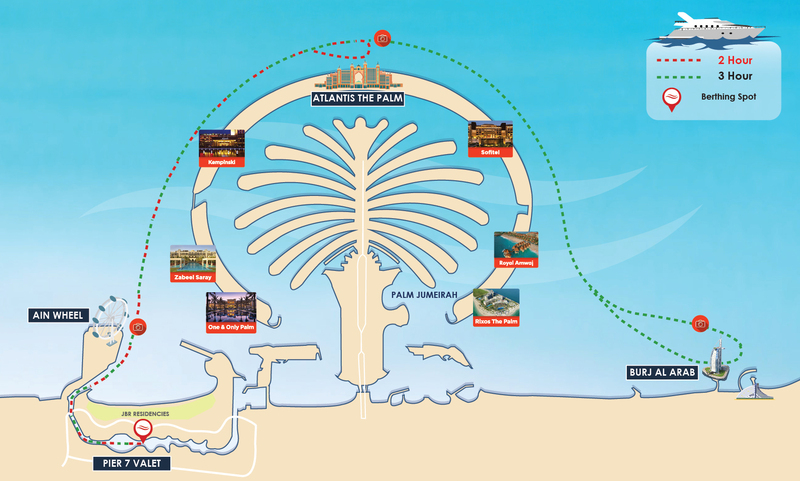 At the head of the island is the Atlantis Hotel, famous for its massive arch and unparalleled luxury. As you go around the Palm, the World Islands are visible in the distance. You will also pass by the Royal Amwaj and Rixos. You will end your tour with a visit to the world-famous Burj Al Arab. The 280-meter hotel is breathtaking to see, and you can see the resemblance of the building to the sail of a ship. The Jumeirah Beach Hotel can be seen behind it, and as the yacht goes back towards Pier 7, Westin can be seen on the left. You will return to the starting point in 2 to 3 hours, after a memorable cruise. Barbecue and soft beverages in the afternoon and evening tours. Pastries and juice during the morning tour. 5.30 PM to 7.30 PM. Note: Yacht Selection will vary depending on weather and capacity requirements. You must assemble at Pier 7 Valet Parking, Marina Promenade, Dubai Marina, Dubai, United Arab Emirates, 15 minutes before the cruise departs. By Bus: Get off at Jumeirah Lake Towers using buses JLT1, JLT2. By Light Rail: Get off at stop Jumeirah Lakes Towers using tram T1. By Metro: Get off at Jumeirah Lakes Tower using line MRed. You will receive an email confirmation with your Luxury Yacht Cruise ticket voucher shortly. Please display your mobile vouchers with a valid photo ID at the meeting point.